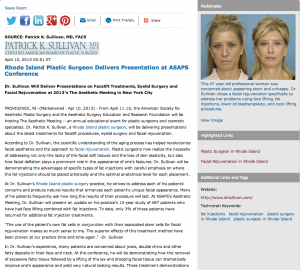 Rhode Island Plastic Surgeon Delivers Presentation At ASAPS Conference - Patrick Sullivan, M.D. Dr. Sullivan will deliver presentations on facelift treatments, eyelid surgery and facial rejuvenation at 2013’s The Aesthetic Meeting in New York City. Providence, RI – From April 11-16, the American Society for Aesthetic Plastic Surgery and the Aesthetic Surgery Education and Research Foundation will be hosting The Aesthetic Meeting—an annual educational event for plastic surgeons and cosmetic specialists. Dr. Patrick K. Sullivan, a Rhode Island plastic surgeon, will be delivering presentations about the latest treatments for facelift procedures, eyelid surgery and facial rejuvenation. According to Dr. Sullivan, the scientific understanding of the aging process has helped revolutionize facial aesthetics and the approach to facial rejuvenation. Plastic surgeons now realize the necessity of addressing not only the laxity of the facial soft tissues and the loss of skin elasticity, but also how facial deflation plays a prominent role in the appearance of one’s features. Dr. Sullivan will be demonstrating the advantages of specific types of fat injections with careful emphasis on where the fat injections should be placed artistically and the optimal anatomical level for each placement. At Dr. Sullivan’s Rhode Island plastic surgery practice, he strives to address each of his patients’ concerns and produce natural results that enhances each patient’s unique facial appearance. Many of his patients frequently ask how long the results of their procedure will last. At ASAPS’s Aesthetic Meeting, Dr. Sullivan will present an update on his practice’s 10-year study of 487 patients who have had face lifting combined with fat injections. To date, only 3% of these patients have returned for additional fat injection treatments. In Dr. Sullivan’s experience, many patients are concerned about jowls, double chins and other fatty deposits in their face and neck. At the conference, he will be demonstrating how the removal of excessive fatty tissue followed by a lifting of the lax and drooping facial tissue can dramatically improve one’s appearance and yield very natural looking results. These treatment demonstrations illustrate how to resolve the drooping appearance around a patient’s mouth using a combination of lifting, sculpting down excessive fat, and the addition of the patient’s own cells through fat injections. Dr. Sullivan is passionate about meeting his patients’ goals and looks forward to sharing his practice’s success stories with his peers. He feels it is incumbent on plastic surgeons to share what they have learned through their experience and intensive follow-up studies evaluating their patients’ results. Through conferences such as The Aesthetic Meeting, surgeons and cosmetic professionals can come together to learn what works over the long-term in achieving beautiful, natural results. Dr. Patrick K. Sullivan is a board-certified plastic surgeon who earned his medical degree from the Mayo Medical School in Minnesota. He went on to complete his residencies at the University of Colorado and Brown University in Rhode Island. In addition to his role as a public medical author, he has lectured internationally on cosmetic plastic surgery. Dr. Sullivan is available for interview upon request.